Judge William James Haddad (Ret.) served as a civil trial judge in the Law Division’s Jury Section of the Circuit Court of Cook County. He has presided over 350 civil jury trials in Cook County, including complex commercial matters, medical malpractice, product liability, and major accident cases. In September of 2013, Judge Haddad returned from the bench to accept an appointment as Senior Mediator and Arbitrator with ADR Systems of America. In addition to his mediation and arbitration duties, in September of 2014, he rejoined his old law firm as “Of Counsel” to Schlack & McGinnity, P.C. (formerly Haddad, Schlack & Associates, P.C.). Presently, Judge Haddad is Chair of the Board of Visitors at Northern Illinois University College of Law. He is also an adjunct professor in trial advocacy and mediation at The John Marshall School of Law. Judge Haddad has lectured and published articles on trial practice for the Illinois State Bar Journal, the Chicago Daily Law Bulletin, the Illinois Trial Lawyers Association, and the American Bar Association and numerous other organizations. Before Judge Haddad joined the bench, he was a trial lawyer for over 30 years. During that time he also served as President of United States Mutual Association, Inc., Founding Director of the United Trust Bank in Bridgeview, Illinois, Founding President of the Arab-American Bar Association of Illinois, Past President of the West Suburban Bar Association, and Founding President of the Suburban Bar Coalition of Cook County. 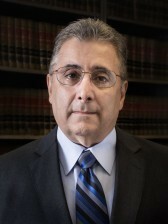 Judge Haddad has received awards and honors from the Illinois State Bar Association, Crime Stoppers, Suburban Bar Coalition of Cook County, West Suburban Bar Association, University of Wisconsin Law School, Northern Illinois University College of Law, Chicago Commission on Human Relations, Arab-American Bar Association, Arab American Business and Professional Association, Muslim Bar Association (2005), Aqsa School, and St. Ignatius High School. Judge Haddad is a graduate of St. Ignatius High School, Marquette University, and DePaul Law School. He is married to Sandra, a pre-school/CCD teacher. His son, William, Jr. is a computer programmer. His daughter, Christina, is lawyer with the Illinois Attorney General. And, his son-in-law, Joshua, is an attorney with the Legislative Research Unit of the Illinois General Assembly.